It is not clear why William Dix moved to Beeston - where he served as village blacksmith for over 50 years - from Gayton in Staffordshire where he was born in 1799. Perhaps he had moved to become apprenticed to a local blacksmith or perhaps he took over an existing smithy - this has to be speculation. It does appear, however, that he first occupied premises converted for him by his father-in-law. William Day, on Market Street (now Middle Street). Day, originally a framework knitter, had developed the site there to include the White Lion public house in the late 18th century. Whether William Dix met Isabella after moving there or whether Day made the changes to accomodate his new son-in-law is also not clear; which ever way it was, there are indications that the proposed marriage and its circumstances had caused difficulties with her parents. Isabella was only 16, nine years younger than William, the twelfth and youngest child of William & Catherine Day. The wedding, for reasons that can only be guessed at, took place in Duffield, Derbyshire in June 1826. Perhaps, as we have seen often, this was a case of parental disapproval, escape from the tie of the parental care role traditionally expected of the youngest daughter - and the imperitive of a child who arrived within five months of the marriage. Whatever the circumstances then, it was the start of a long marriage of over 56 years with eleven children, most of whom were born and raised in the tiny cottage associated with the forge on what is now Wollaton Road where the family appear to have moved to early in their marriage, and certainly before 1840. Four of these children appear not to have survived childhood and another son died at age 13, but each of the other six was to make a significant and varied contribution in Beeston and beyond, to show how one family from a simple cottage in a small community can go on to have a remarkably wide impact. As can be seen from this report in the Nottinghamshire Guardian of 10th February 1865, his life was not without significant setbacks which needed to be overcome. 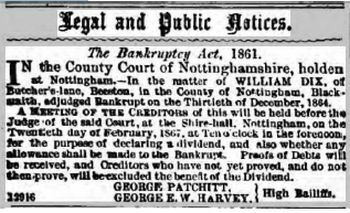 By 1864, William had found himself with considerable money problems and was declared bankrupt, a process that involved examination in the County Court where the rights of the debtor and his creditors were considered and weighed. As can be seen, at William's appearance on 8 February 1865, his sale of a hay-stack and a cow had to be shown to be appropriate in the circumstances. He was finally discharged in 1867. Ann Dix, who was baptised at Beeston in November 1826 was their first child. Both before her marriage and during and after she was widowed, Ann worked as a dressmaker and does not appear to have moved away from Butcher Lane at any time during her adult life. It is therefore strange that her marriage to William Yeomans, in March 1856, took place at St Marys Church in Nottingham. Although William had been born in nearby Lenton, his family had moved to Beeston some years earlier and was well settled nearby on Butcher Lane where they appear to have kept the Commercial Inn. William was a lacemaker who is likely to have worked in the local mills and it was here that the couple settled during the period of their short marriage which ended when William died, aged 39, some ten years later. In that time they had five children - including Sophia who went on to marry John Frederick Doar, the oldest of three generations of grocers who operated from premises in Beeston Square for about 90 years. Rosa was to marry Maurice Boot, from a Lenton family of publicans and to run the Commercial after the death of her parents - and to later become the second wife of William Thornhill. The sisters were clearly very close, even using each others' family names - Markham, Crane, Bloodworth - as middle names for their children. Emma was to move within this network, giving assistance and receiving support over the years, until eventually she herself took over as landlord of an inn in Whetstone, up to her death there in 1898. Catherine Dix, born in 1835, married John Hallam, a policeman then stationed at Stapleford but who went on to rise through the ranks in the Derbyshire force, with many years as Superintendant of the Chapel-en-le-Frith district of that County. They had two children. Following retirement, the couple moved to Blackpool where they lived out the rest of their lives. Eliza Dix was born in 1850, married George Needham, a lacemaker, at the age of 19, a few months after giving birth to a son, William. For a short time, the couple lived in Long Eaton with Eliza's son William - then with the name Needham - before returning to Beeston where William went to live with his grandparents while George and Eliza settled in West End where they raised six children. Samuel Dix, the youngest child, born in 1856 - a remarkable 30 years after the birth of his youngest sibling - stayed to assist his father at the smithy, remaining there and living with his parents until after his parents' deaths in 1882. In 1885 he married Emma Houlton and moved to Wilford Road, Nottingham where they operated a beer off-licence and were to have three children. He later returned to Beeston and died at 24 City on 27 May 1905, aged only 49. He wa interred in Beeston Cemetery but no memorial stone survives. With the deaths of William & Isabella Dix, within twelve days of each other in December 1882, there ended a marriage of over 56 years. William had served Beeston as its blacksmith for almost all of that time and six of their eleven children had gone on to raise families of their own - 27 grandchildren in all. A remarkable achievement from this modest cottage which now survives for future generations. Click here to read more about the smithy site on Butcher Lane (now Wollaton Road).